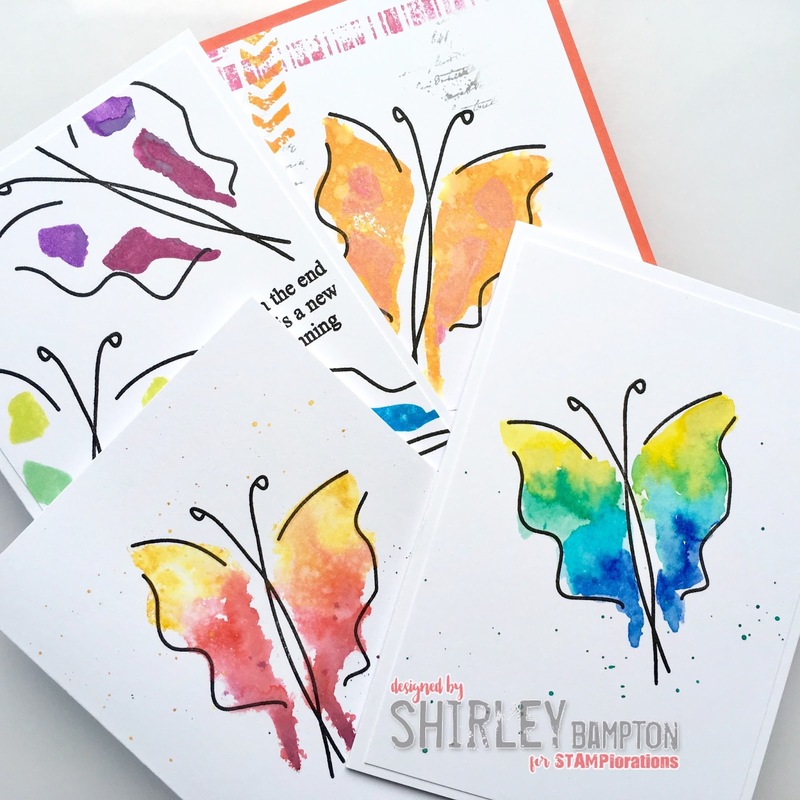 I'm over on the STAMPlorations blog playing with my newest set, Layered Butterflies. 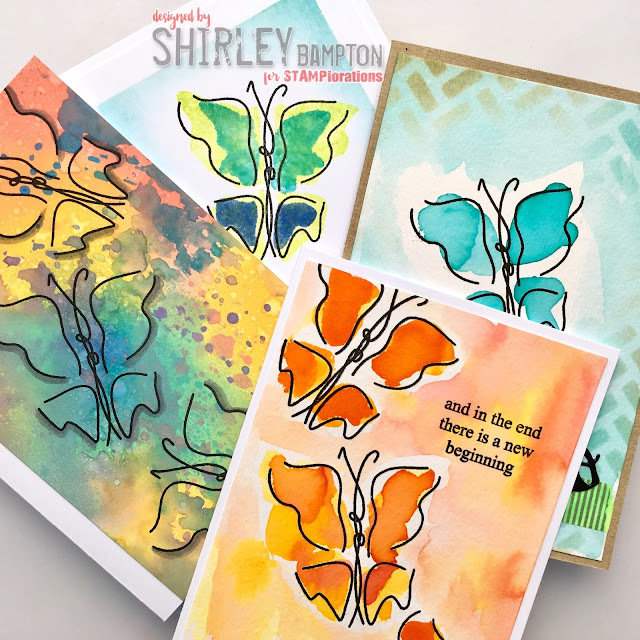 Last week, I focused on the smaller butterfly stamps, and this is the group photo that you should have seen in last week's post. Instead, you saw the group post for today's focus, the larger stamps. So last week you got a sneaky sneak peek, and this week you get double bubble. 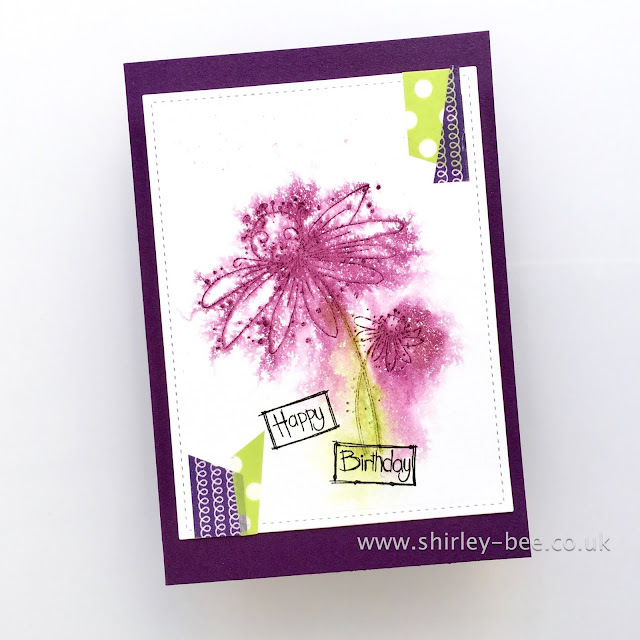 Next week you'll see how I've mixed, matched, added and subtracted the two sizes of stamps. Pop on over to the STAMPlorations blog for a full view. Next week is the official launch, and there'll be a chance for you to win this set by leaving a comment on the blog post. 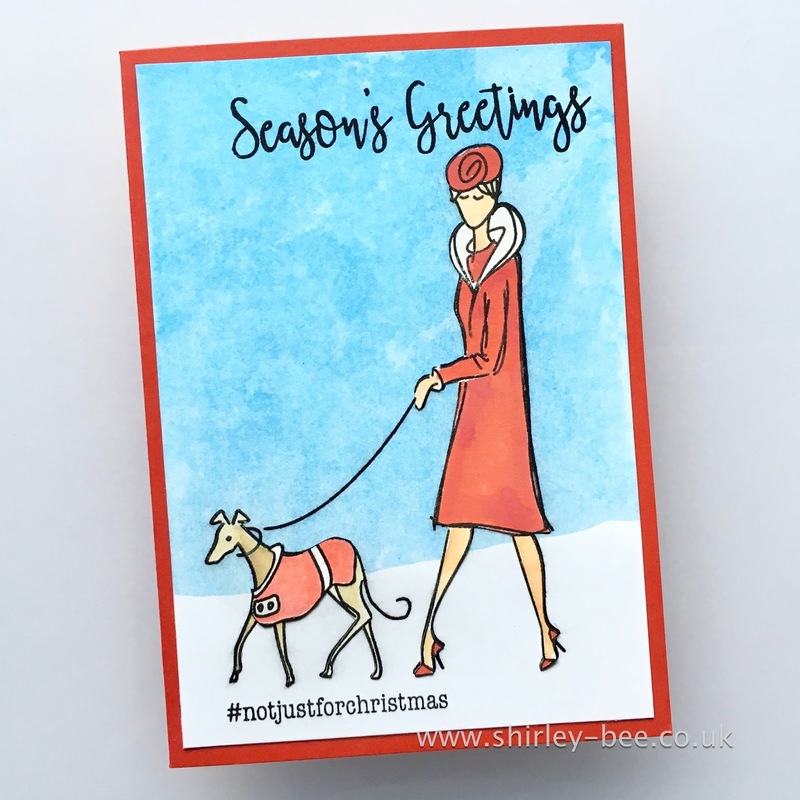 If you can't wait till then, they're already in the store, and if you use my code STAMPGIRLSHIRLEY you'll get 20% off. 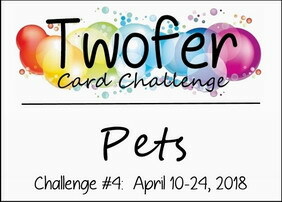 This month's Twofer challenge is all about Pets, so I couldn't resist playing along with these two cards. 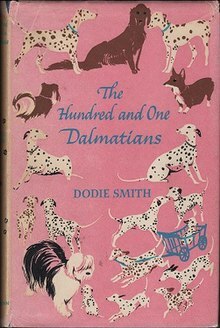 My first card was inspired by the current challenge at The Library Challenge - 101 Dalmatians. I used one of my new stamp sets, Hashtag Walkies, and set to work with a black paint pen to create two faux-dalmatian coats. 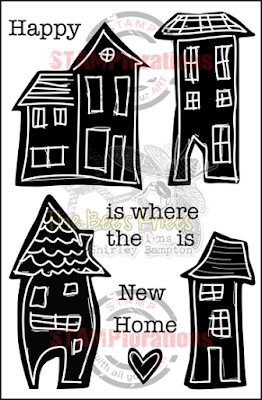 Then I masked the images while I sponged the background and stencilled the sentiment. 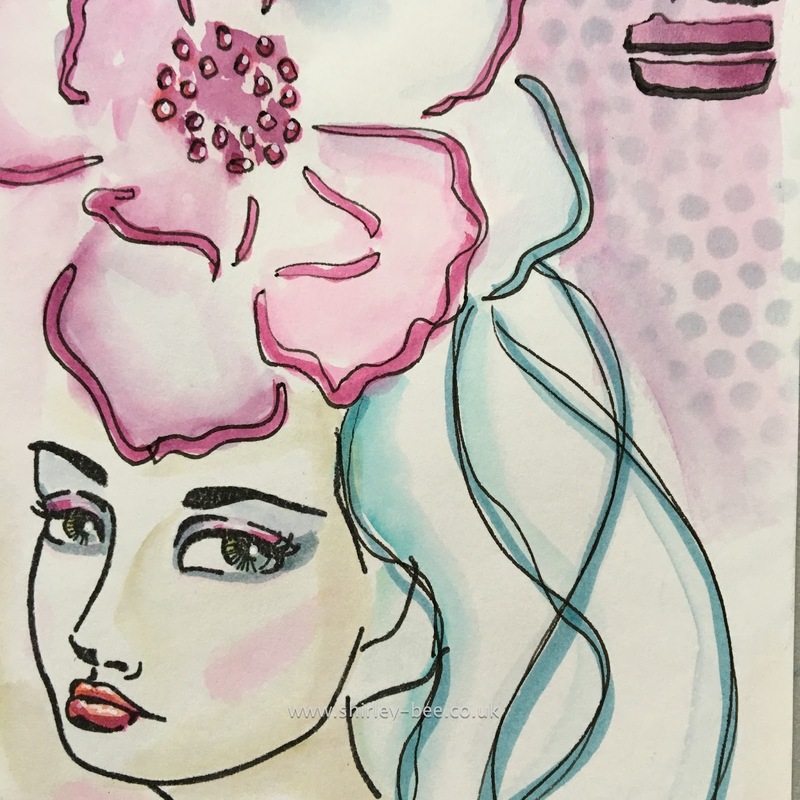 The background was in my stash from my attempts at a Jennifer McGuire technique using alcohol inks, which I won't be trying again! But waste not, want not. I stamped the image onto the background, then again onto cartridge paper. I used Distress Oxide re-inkers two watercolour the images, then fussy cut them and stuck them into place. 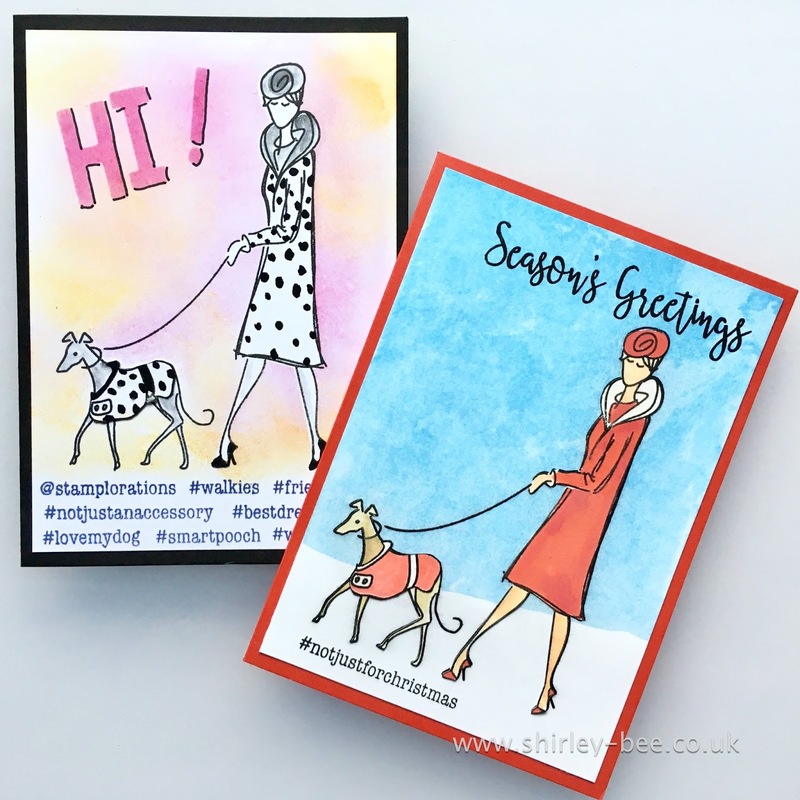 The Season's Greetings sentiment is from Layered Holly. Toffee tiptoeing through the, erm, daffodils! The smaller Jane Davenport face stamps are perfect for 'selfie' cards. 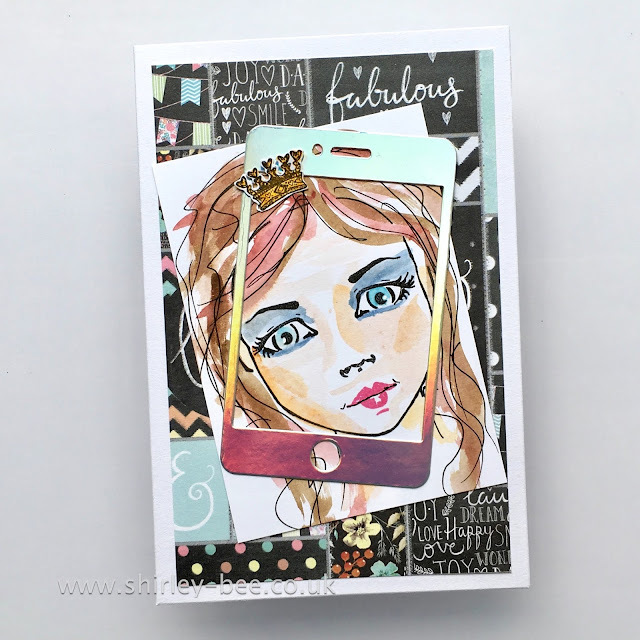 I added a mirri smartphone diecut (Kelly Purkey - maybe discontinued?) for a bit of shine, so it's going into Simon Says Wednesday Challenge - Sparkle and Shine. The tiara is a Crafty Individuals stamp and the patterned paper is from Craftwork Cards. 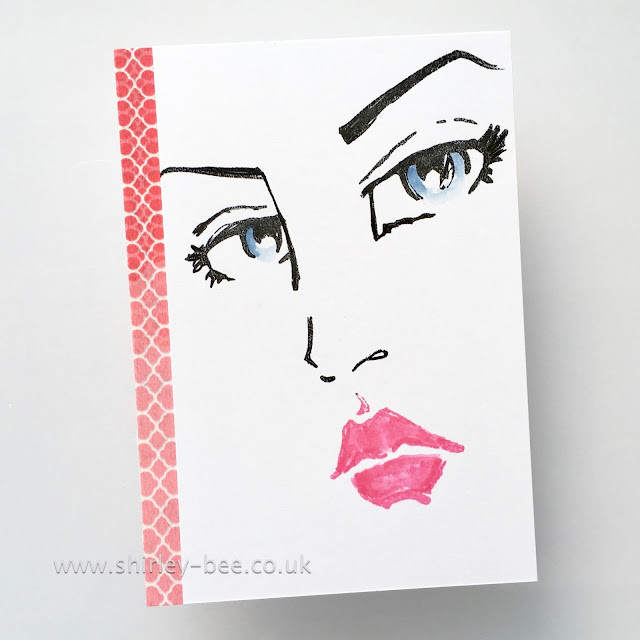 I've also been enjoying stamping, stencilling and doodling with the small Jane Davenport faces in my journals, so this next one is going into Simon Says Monday Challenge - Let's Doodle. I doodle-stencilled the flower, then doodled the hair and around the stencilled word 'found'. Here's a close-up. 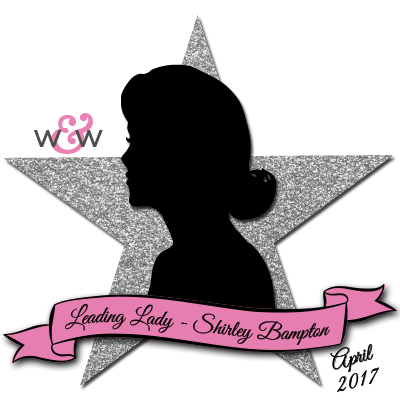 Welcome to Inspiration Tuesday at STAMPlorations! 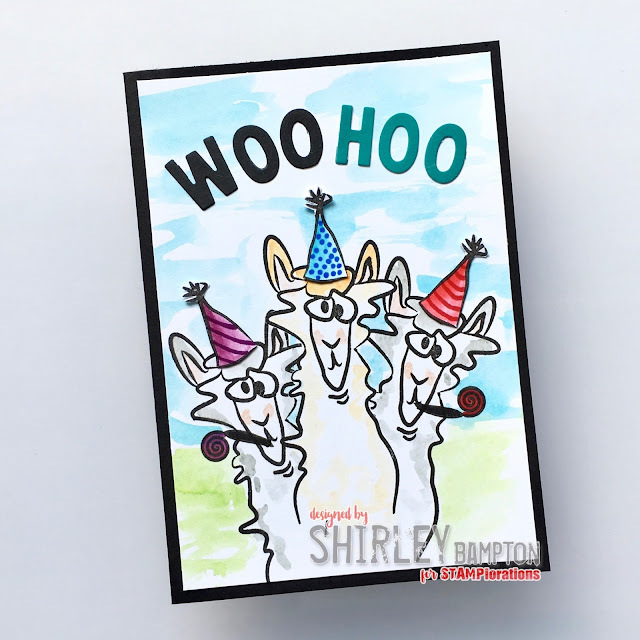 This week we're highlighting Becca's line of stamps, Big Grins by Becca Cruger. 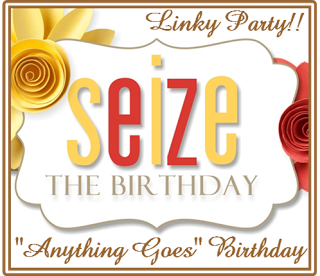 I've used this funky set, Llama Tell You, to make a fun birthday card. I stamped and masked the llamas, coloured them in, then added a watercoloured background and a few party accessories - well, they look like party animals, don't they? Pop on over to the STAMPlorations blog for some more fabulous inspiration from the team, and don't forget to leave a comment for your chance to win a gift certificate to the store. 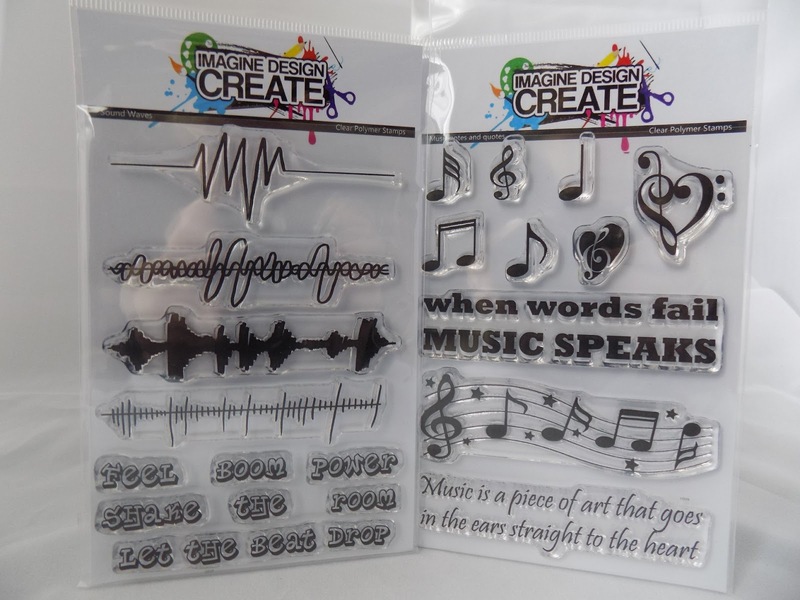 Through April all stamps (except retiring sets), stencils and dies are 10% off, no code needed. And while you're shopping, if you use my code STAMPGIRLSHIRLEY you'll get an extra 20% your order. What's not to like? 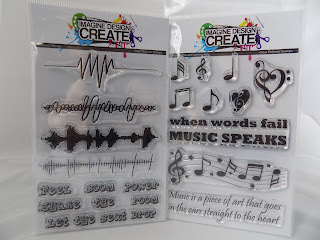 It's a new month and a new challenge at Craft Stamper Take It, Make It. 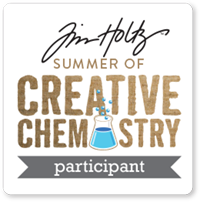 It's Anything Goes, so as long as you've used physical polymer or rubber stamps, and don't include more than one project in your post, you're in! 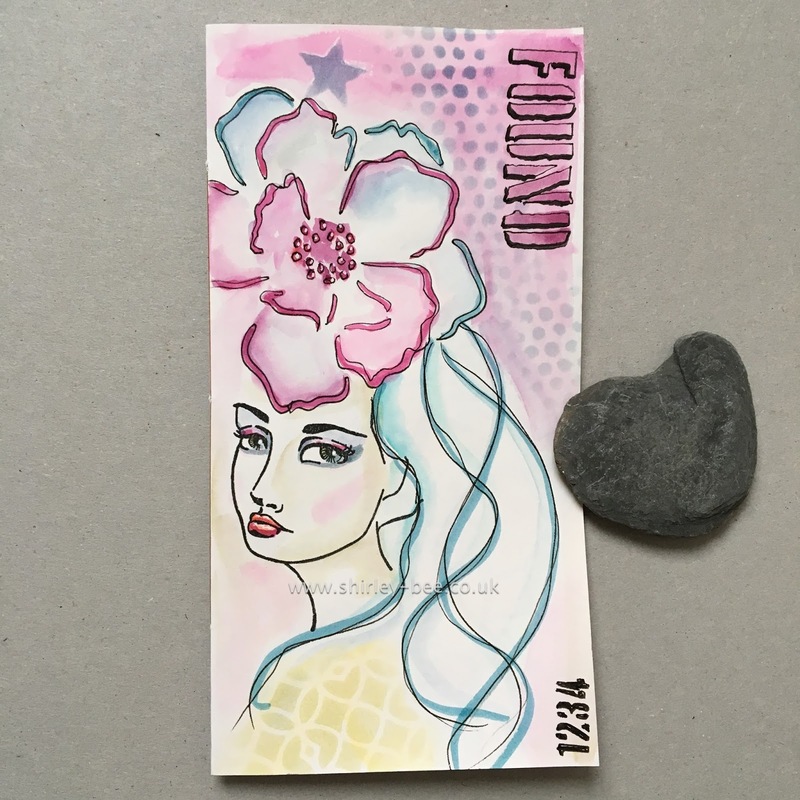 I've used a Jane Davenport face stamp, sloshed some Distress Ink watercolours on, added some stencilling, and black and white pen work. The background is a Darkroom Door stamp. 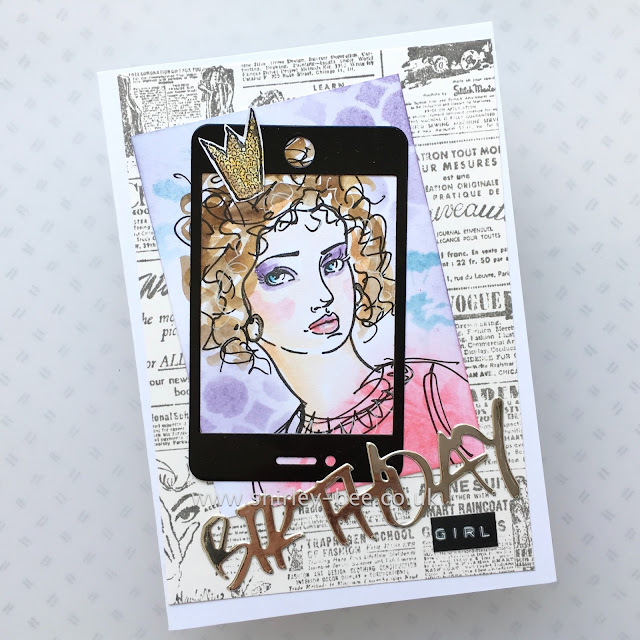 I've layered a phone diecut, Birthday diecut (STAMPlorations), crown (Crafty Individuals) and Dymo girl to complete the card. Oh, and a little Gelli Roll Star Dust on the earrings and crown. 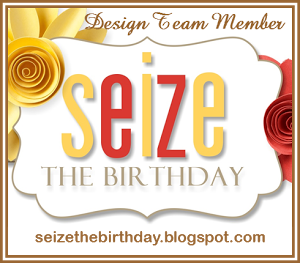 The winner chosen by the Design Team will have their winning entry published in Craft Stamper Magazine along with a bio, a bio post on the blog, and the opportunity to guest design in a future challenge. 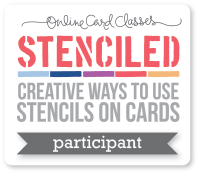 Get stamping, it could be you! 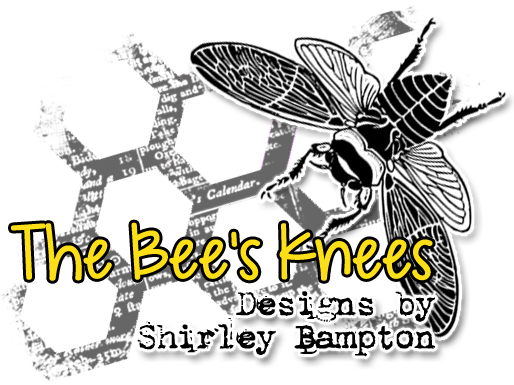 It's Inspiration Tuesday at STAMPlorations, and this week we're featuring my stamp line, The Bee's Knees. 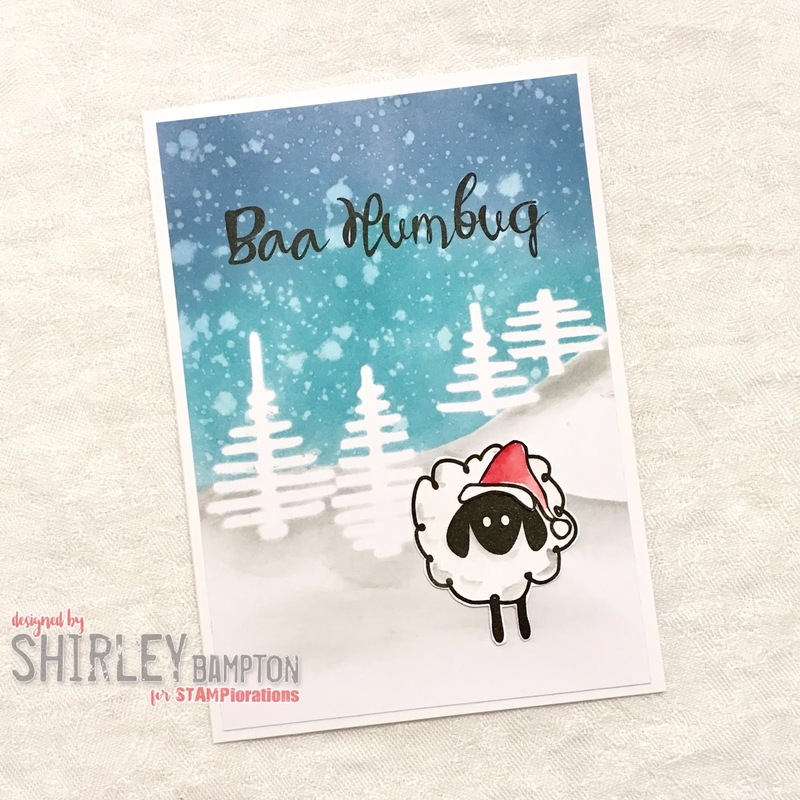 I've used my new set, Baa Baa, for a Baa Humbug card. The background is Distress Oxides splattered with water, Sanna's tree masks and a bit of hill shading. I stamped the sheep and hat on spare card, coloured and fussy cut them, and attached to the panel. 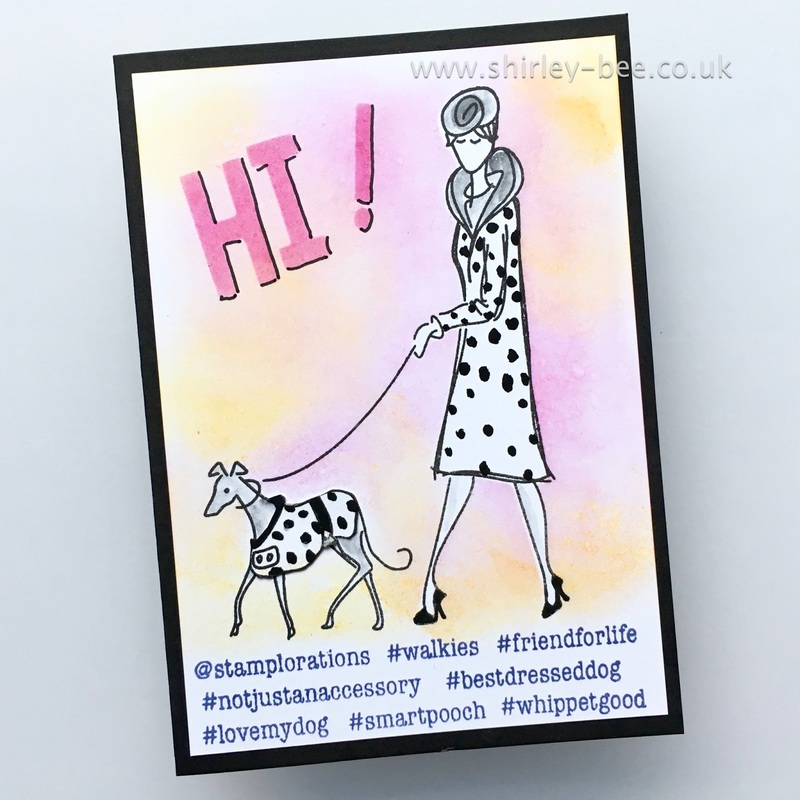 Throughout February to April, all stamps (except retiring sets), stencils and dies are 10% off, no code needed. 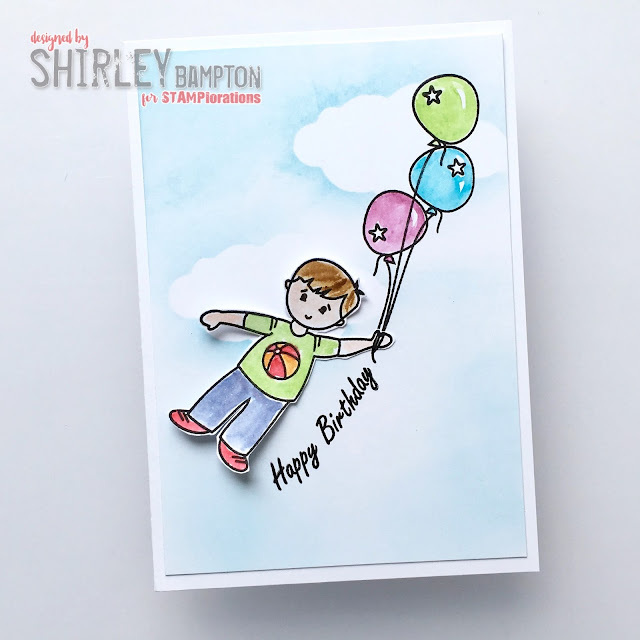 But if you use my code, STAMPGIRLSHIRLEY, you'll get another 20% off. What's not to like?